Asif Hossain, a junior at Butler University, makes remarks at the vigil as the Muslim Student Association president. The vigil took place at Star Fountain and then moved to Clowes Memorial Hall. Photo by Jessica Lee. 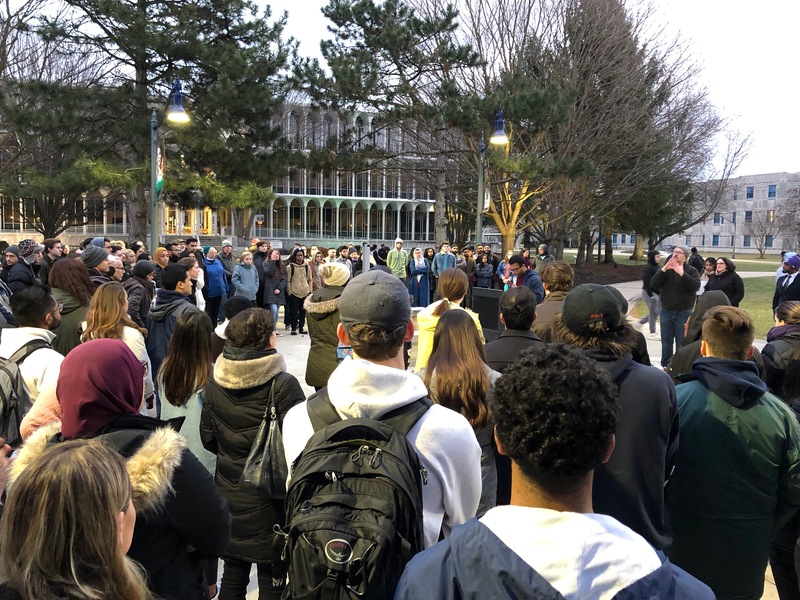 On March 21, students and members of the Butler University community joined together for a vigil to honor the victims of the mass shooting that took place in Christchurch, New Zealand. It was organized by Butler’s Muslim Student Association and the Muslim Alliance of Indiana. Several other religious organizations on campus and in the surrounding area joined to speak and show support. The ceremony was in response to 50 people killed in the terror attack on two mosques on March 15. New Zealand Prime Minister Jacinda Ardern called the unprecedented mass shooting the “darkest day” in the country’s history. Asif Hossain, a junior at Butler and MSA president, said it was important to hold the vigil quickly after the tragedy because over time, some people forget. “You don’t want to let an opportunity like this go, to teach our community about the things that still exist — the hate that still exists around the world,” Hossain said. The vigil started at the Star Fountain, where several speakers offered prayers and words of grief but also of resilience. Speakers included Butler President James Danko, director of Center for Faith and Vocation Daniel Meyers, Sara Abusnaneh of MSA and local faith leaders from the Jewish, Christian and Hindu community. Meyers said one of CFV’s main roles is to be the support system for a community when it is hard to know what do in a time of loss and suffering. When several different faith communities come together, it makes an experience stronger and richer. The event then moved to the Krannert Room in Clowes Memorial Hall. Remarks were made by Sajjad Shah, founder of Muslims of the World, and activist Khaled Beydoun, who had flown in from Detroit that day. Beydoun’s speech focused on honoring and saying the names of the victims, not of the shooter. During the candle lighting, the names of the victims were read by students from several campus faith organizations, including GraceUnlimited, Hillel and South Asian Student Association. A moment of silence followed. “It was just so heart-warming to see people from all different walks of life here, gathered, for one purpose, and that’s in our shared humanity,” Amin said. In New Zealand, a nationwide moment of silence was observed on March 22.